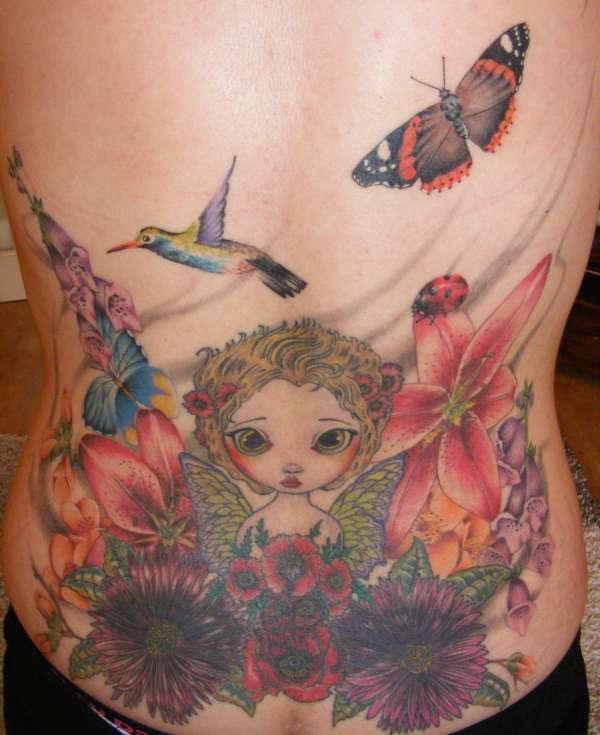 This is a custom piece done by Lianne moule of immortal ink, Chelmsford, Essex, U.K.
Alot of meaning has gone into this tattoo, They are my familys flowers, the ladybird for my daughter, the red admiral butterfly becoz thats what I saw at my bedroom window 2 days after my Daddy passed away. The humming bird for my Mummy & the blue butterfly for my husband. THIS IS A COVER UP SO CHECK OUT HOW THIS USED TO LOOK. absolutely love it!!! I plan on doing a big cover up piece. I am sure its going to have to be done in color. I am glad to see that it is very possible when done right!....LOVE IT!! & BTW @TzaiWe, you are wrong wrong wrong! The cover up is perfect!